This book presents a complete course in web design using HTML5 and CSS3. It starts with a crash course in the first 8 chapters...including a new chapter on Responsive Web Design...that gets your students using HTML and CSS at a professional level. It is followed by three sections that can be taught in whatever sequence you think works the best. In the 8 chapters of section 1, your students will learn how to use HTML5 to mark up the content of web pages and CSS3 to present that content. In fact, by the end of section 1, your students will be able to develop web pages the way today’s best professionals do. That means they will be using the HTML5 semantic elements to mark up the structure of a page. They will be using float and the CSS box model right from the beginning. And they will be using a professional subset of HTML5 and CSS3 that consists of the most-used HTML elements, CSS selectors, and CSS properties. Now, in this new edition, your students will also learn how to use Responsive Web Design so their pages will work on all screens, from mobile devices to computers. This, of course, has become an essential skill for all web developers. That’s why it’s in the first section of the book. Section 4 consists of two chapters. Chapter 18 presents today’s best practices for designing a website. And chapter 19 shows not only how to deploy a site on a web server, but also how to get the site indexed on the major search engines and directories. Because of the modular structure of this book, you can teach these chapters any time after your students finish section 1…immediately after, if you want. Most important is a new chapter on Responsive Web Design that presents all of the skills that your students need for building responsive websites that will work on all screens, from phones to tablets to computers. Chapter 8 in this book shows how to build responsive web pages with fluid layout, scalable images, and media queries. It also shows how to use a jQuery plugin called SlickNav to convert the menus for a page to a form that works on mobile devices. So, in this one manageable chapter, your students learn all the skills that they need for building responsive websites at a professional level. This book is currently used in dozens of colleges and universities under a variety of course titles. In general, though, these course titles fall into the two categories that follow. 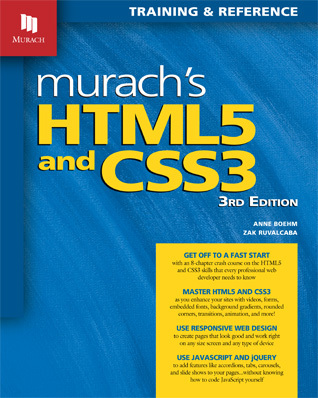 If you want to teach a web design course that is, in essence, an HTML5 and CSS3 course, this is the book for you. But it will also work for an introductory web design course that doesn’t cover HTML and CSS in as much depth. Because all of the sections and chapters after section 1 are independent instructional modules, you can teach section 1, select the remaining chapters that you want to include, and skip the other chapters. In that case, your students can use the rest of the book in an advanced course or as a reference for their own work. Of course, if you or your students are already familiar with another text editor that has similar features for working with HTML and CSS, it can be used instead. Since Internet Explorer and Safari are installed automatically, your students won’t have to install either of those browsers. And the appendix in this book shows how to download and install Firefox and Chrome. Remember that this book is modular. That means that you can teach the chapters in sections 2, 3, and 4 in whatever sequence you prefer after your students complete section 1. That gives you content options like those that follow. Section 4 consists of two chapters. Chapter 18 is “How to design a website,” and chapter 19 is “How to test and deploy a website.” Because these chapters are independent modules, one of your content options is to teach either of these chapters right after your students complete section 1. If, for example, the focus of your course is more on web design than HTML and CSS, we recommend that you teach chapter 18 right after section 1. That way, your students learn the principles of web design right after they learn how to use HTML and CSS to build web pages. We think this works better than teaching the principles of web design before your students have seen how the theory is applied in the real world, which is the way most textbooks handle this. Section 2 presents professional skills for enhancing a website, like: working with images, using tables and forms, adding audio and video, and printing a web page in a readable format. Remember, though, that you don’t have to assign all of these chapters. You don’t even have to cover every single topic within a chapter. You can choose just those that meet your course objectives. Remember, too, that you can teach the chapters in any order. Of course, when in doubt, the sequence in the book works well. In general, this sequence moves from the simple to the complex, and from the most useful skills to the least useful. But don’t hesitate to modify it. Often, the most effective teaching sequence is the one that best reflects the interests of your students, and this book enables you to structure your course that way.